Patisserie-This lipstick is a 'your lips, but better' and more glossier option. This photo doesn't show you just how worn down this lipstick is, in fact it will probably be my first ever Mac lipstick repurchase. Patisserie is one of those lipsticks that you can just throw on without needing to use a mirror and be good to go*. As it is a Lustre finish it does not boast the most amazing lasting power but it is so easy to touch this up. Show Orchid-Mac describe this as a vivid hot pink. It has a subtle shimmer throughout so I like to wear this at night. This is a lipstick that I don't wear all that often but when I do I am reminded why I love it. If you're not a fan of the neon Barbie pinks then you might like this shade. Impassioned-This is another of my favourite Mac lipsticks. It reminds me of Relentlessly Red but a pinker, glossier version. I love to wear this one in Summertime or if I am having a below average day. It sounds silly but there's something about bright lipstick that just seems mood raising. This is another long-wearing shade but to increase the wear time I apply the Embrace Me** pencil underneath. Rebel-Rebel is my newest Mac lipstick. It is a shade I have wanted for a while and one which will definitely get a lot of wear over the Autumn and Winter months. This plum shade is so gorgeous on. I initially thought it'd be too dark for my liking. The colour intensity really depends on how many layers you apply though. It is such a stunning shade and I know it will be getting a lot of use later in the year. So there you have it. I have a liking for Mac's pinks and reds it seems. Do you have a favourite shade? Let me know in the comments below and I'll have a swatch of it on my next Mac visit. *Unless you have worn it down as much as I have in which case using a mirror is necessary. **This isn't showing up online so I think it may be limited edition, sorry! Shock Value or Dynamo are great pink liners as well. 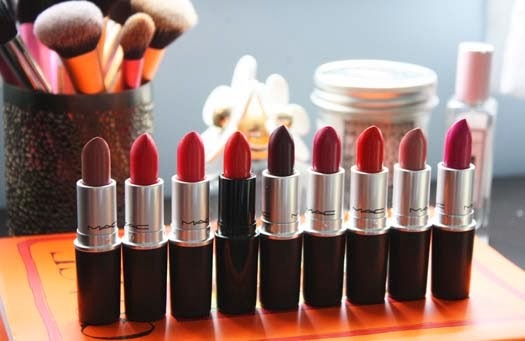 Why do I not have a Mac lipstick yet? Oh yeah, because I'm a poor student, haha! These are all gorgeous, especially love Impassioned and Creme Cup.